Client: Reynolds, Smith and Hills, Inc. 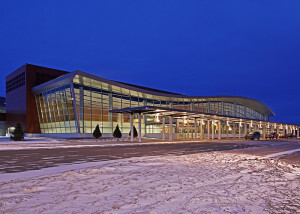 The new passenger terminal at the Duluth International Airport is a three-story, 100,000 square foot structure framed with composite steel and set on conventional spread footings. The building’s lateral-load resisting system is composed of concrete shear walls and braced frames. 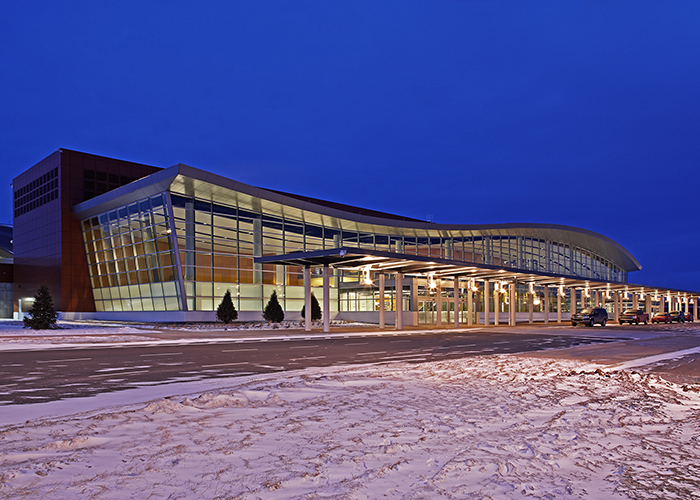 At the entrance a large pavilion with a curved roof, double cantilevered corners, and glass curtainwall rises 34 feet, providing passengers a sheltered waiting area for vehicle pick-up and drop-off. 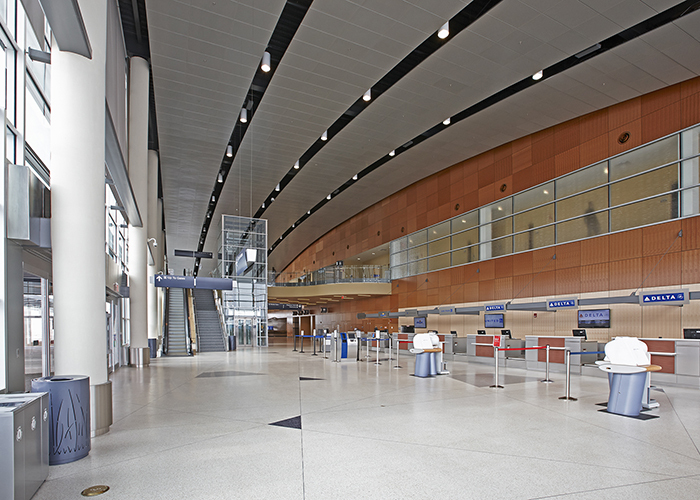 During the structural system selection phase, Meyer Borgman Johnson provided six different structural system pricing options including a cast-in-place concrete/structural steel hybrid, composite steel framing, precast plank on steel beams, and an all precast system. 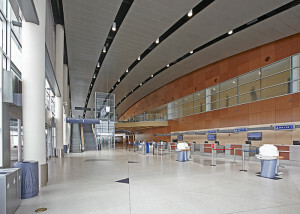 In addition to cost, acoustical requirements and geometry played strong roles in the final system selection. 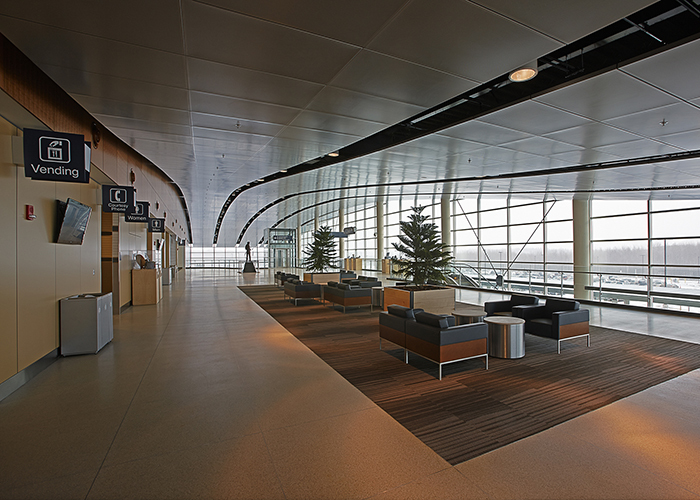 To help mitigate jet noise coming from the nearby 148th Fighter Wing, Minnesota Air National Guard, the acoustician on the project recommended a structural dead load of 100 pounds per square foot over the 3rd floor office spaces and 50 per square foot over the landside pavilion. MBJ’s concrete slab thicknesses were chosen to provide the required dead load and economize the structural steel beam sizing. The facility is provisioned for future expansion to the east and west, as well as one vertical story in certain locations. 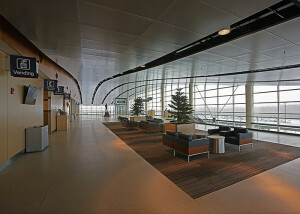 Architectural finishes include curtain walls and metal panels over the majority of the building exterior.